Helene Steene arrived from Sweden 1976, after having lived in England, Germany, Spain and Greece. She received part of her art education from George Washington University in Washington DC, and 2004 a Master of Fine Arts from University of Kentucky. Her works have won numerous awards, and have been shown in more than 200 exhibitions around the world. Her pieces can be found in both private and public collections in both the US and Europe. 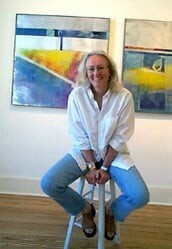 Helene has a studio at the Lexington Art League, where she presently works on a series of mixed media paintings. The paintings are created with textures and layers of information built up through additions and subtractions using sand, metal, acrylic, oil and marble dust, inspired by the walls and wood works she encounters every summer on her stays on the Greek island of Paros, which also has inspired her colors for many of her works. “I work intuitively in all my art forms, enjoying the sometimes unexpected results achieved by mixing different techniques and materials. When working on a piece, and colors, textures, lines and strokes start to speak to me, then the dialogue between the work and myself is all that matters. Whether my work is abstract, nonobjective or figurative, there is always a search for something that signifies a subtle inner beauty, depth and simplicity even when the forms are complex. I am intrigued by the tension between people, forms, lines and colors that ultimately can resolve in harmony. Sometimes, this is achieved with more obvious forms, and sometimes, with a delicate balance attempting to give substance to the space that exists precisely because there are no objects.